My answer: A few hours ago! If you had asked me yesterday, though, I would have struggled to think of the last time I climbed a tree. Probably when I was around 9 years old–there were a few trees in our yard that I could shimmy up. 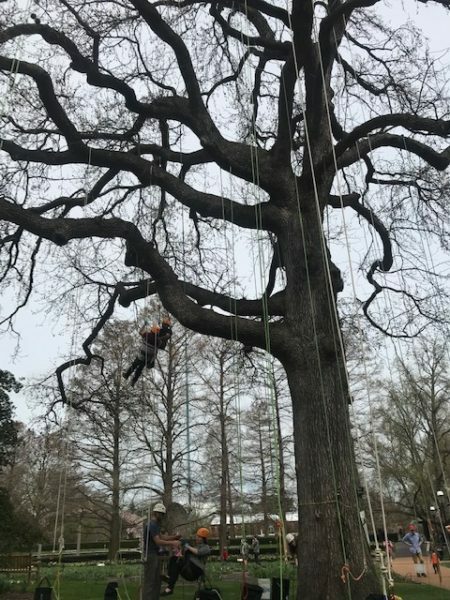 But then yesterday a friend went to the Botanical Gardens here in St. Louis and discovered that a local organization called The Warrior’s Way was helping people climb a massive gumball tree. She gave it a try, and it sounded like a fun workout, so I went with another friend today. As you can see in the photo, the ropes were pre-strung to the tree. 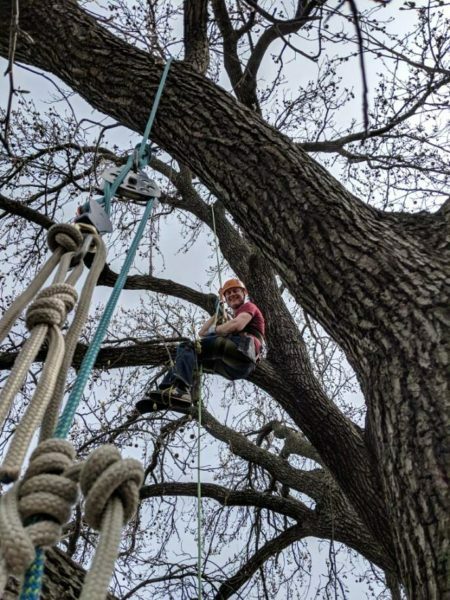 You wear a harness, learn a few simple techniques, and then start “climbing.” For each step in the climb, you’re straightening one of your legs while pulling on the rope. Then you lean back and relax as long as you want to before moving up another few feet. I wasn’t sure I’d like it, and for the first few feet I was still quite dubious. But I got a few additional pointers from the very friendly crew, and after that it was SO MUCH FUN. It was a workout, but it was also surprisingly relaxing. There’s no pressure, no race, and plenty of time to relax and chat. I’ve tried rock climbing, and while I’d like to try it again, I think I’d be more inclined to try this style of tree climbing again. It was awesome, and I highly recommend it. Also, it’s a good chance to find out if you’re afraid of heights! This entry was posted on Sunday, April 7th, 2019 at 10:10 pm	and is filed under Uncategorized. You can follow any responses to this entry through the RSS 2.0 feed. That looks awesome! I gotta get to St. Louis. A few weeks back I was in Sacramento and they have orange trees outside their capital building. I climbed one pretty high up to pick some for myself and my friends. It was great (and the oranges were delicious). I try to climb trees whenever I can. At 51, it’s been more than half a lifetime ago. We, as late teenagers/early 20 somethings were “LARP”ing before it actually had an acronym, and as one of the more nimble members of the group I would often find a perch from where I could rain down arrows on unsuspecting orcs, conjured up by our DM.